Elementary Students are routinely expected to arrive at all 4K-6 buildings at 8:20 AM with the start of the school day beginning at 8:35 AM. Students are marked tardy for the first ten minutes late to school and absent for the first hour if they arrive after that. Elementary school ends at 3:35 PM. All students are expected to be in school for the full school day. If it is necessary to remove your child from school prior to the end of the school day, it is considered an absence for part of the school day. If your child is absent from school or if you wish to pick up your child early, please send a note or call the school building office. Parents may excuse their child from school attendance up to 10 times in a school year – a written note must be on file for each absence. It is acceptable to call in an absence but the student must bring a written note with a parent/guardian signature upon returning to school. Failure to provide the written documentation will be considered an unexcused absence. Middle school doors open at 7:15 AM with the start of the school day beginning at 7:20 AM. Middle school ends at 2:40 PM. All students are expected to be in school for the scheduled school day. If it is necessary to remove your child from school prior to the end of the school day, it is considered an absence for part of the school day. If your child is absent from school or if you wish to pick up your child early, please send a note or call the school building office. Parents may excuse their child from school attendance up to 10 times in a school year – a written note must be on file for each absence. It is acceptable to call in an absence but the student must bring a written note with a parent/guardian signature upon returning to school. All absences due to dental appointments, doctor appointments and court appearances must be followed up with written documentation of the appointment (i.e., reminder cards that are received in the mail for doctor or dental appointments). Failure to provide the written documentation will be considered an unexcused absence. All visitors upon arrival at school must check in at the school office. During the school day, parents will not be allowed to visit their child’s classroom. Arrangements and appointments can be made for you to visit the classroom and to confer with the teacher, just not during the instructional day. Information, packages, forgotten items, etc. should be left in the office and they will be delivered to the child at appropriate times. If a change in routine events occurs, please allow enough time for the building secretary to contact your child’s teacher about the change. Many times students become confused about the change and follow-up information is needed. If you want to change a school departure routine (ride the bus, don’t ride the bus, someone else is picking up your child, etc.) 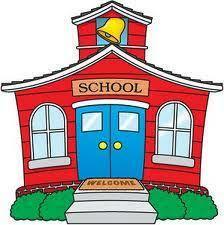 please make arrangements prior to your child coming to school. Your cooperation is appreciated.